Information on existing freshwater datasets is indispensable for ensuring its discovery and (re)use, e.g. in large scale analyses. 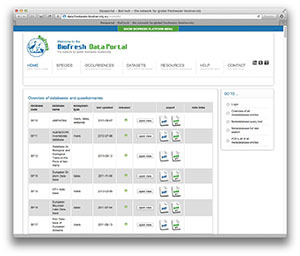 The metadatabase on freshwater related datasets was built as part of the EU BioFresh project to centralise such information and provide free and universal access to it. The Freshwater Metadatabase collects various characteristics describing a specific dataset. This includes information about the data provider and the related intellectual property issues, as well as characterising parameters like regional coverage, spatial extend or information about environmental and climate related parameters. Regarding the collection of the relevant information a metadata questionnaire was developed. To prioritise data entry, fields are marked as mandatory/conditional, recommended or optional. In terms of clearness and user friendliness fold-out sections, checkboxes, selection lists as well as tooltips for further data field explanations are on hand. 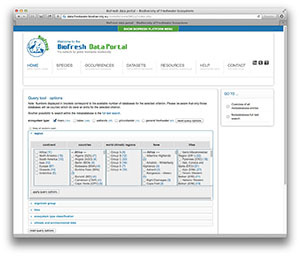 Publishing data via the Freshwater Metadatabase creates high visibility of your dataset as scientists and the interested public can discover useful datasets for analysis and for starting collaborations via the metadata query tool with multiple options to choose or a full text search on the database. Additionally we have created the Freshwater Metadata Journal which allows to publish your metadata as journal article with an assigned digital objective identifier (DOI) making it easily traceable and citeable like any other scientific article thereby increasing recognition for your work. 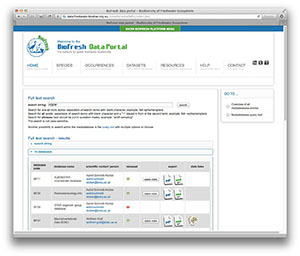 If you are interested in submitting your metadata to the Freshwater Metadatabase, please do not hesitate to contact Astrid Schmidt-Kloiber (BOKU) or write to data@freshwaterbiodiversity.eu.